Evans was on hand for the Northern Virginia Chamber of Commerce Greater Washington Government Contractors Awards™ last night. It was an especially exciting night for Evans because we were formally nominated for the Contractor of the Year for companies up to $25 million. Evans was incredibly honored to have been nominated amongst so many other outstanding firms. 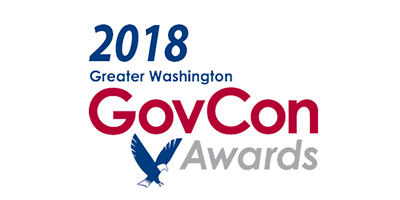 While we did not win this particular award, we did receive another award for the outstanding 2018 Small Business Government Program of the Year! The Program of the Year Award recognizes the most exemplary program of the year among all programs described on the contractor of the Year applications. Evans received this award for our collaboration with the Loudoun Sheriff’s Office (LCSO). In addition to Evans’ recognition, LCSO’s drone program was also recently recognized as they received the Virginia Association of Counties Award (VACo) for a model local government. In 2017 and 2018, Evans worked with LCSO to help them get trained and to obtain the necessary waivers to be able to operate an Unmanned Aircraft System (UAS), or drone. This support resulted in an immediate impact for the County by facilitating the use of a new technology to promote public safety. LCSO has since executed multiple successful search and rescue missions using their drone, including rescuing and saving the life of a 92-year-old hunter who was lost in the Shenandoah mountain range in December 2017. Evans worked with the county to train their pilots to be good stewards of the National Airspace System, and to successfully navigate regulations and rules related to operating drones in complex airspaces in the County. The results to date have been significant, but the potential of this technology extends beyond search and rescue operations. LCSO can use this technology to recreate accidents by taking aerial images of car crashes, among other many uses. It is so rewarding to have been a part of this successful collaboration with LCSO, and it was even more rewarding to receive such outstanding recognition from the NOVA Chamber of Commerce and such a highly regarded government contracting community.